AAPL is up +6.01% for the week, down -1.61% for the month, up +21.90% for the year, and up an amazing +209.08% since the March 9, 2009 market bottom. This equates to +$14.56 for the week, -$4.21 for the month, +$46.15 for the year, and an incredible +$173.17 since the March 9, 2009 market bottom! In addition, Apple is down -5.15% or -$13.95 from the 2010 YTD, and all-time, high, of 270.83 on April 23. By comparison, the overall market, the S&P 500, is down -8.20% for the month, down -2.30% for the year, up +61.03% since the March 9, 2009 market bottom, and down -10.50% from the 2010 YTD high on April 23. AAPL has held up better than the overall market. Apple's market capitalization at $233.74B is now second largest in USA, behind only Exxon at $284.04B. Below is the AAPL daily chart for 2010. The intermediate-term signal, the comparison of the 25 day and 50 day simple moving averages, generated a buy/long/bull signal on Friday, March 12, 2009, which remains intact. Therefore, AAPL is in an intermediate-term bull market and has remained so during the recent market pullback and related Flash Crash. That is, the 25d sma is higher than the 50d sma. The current closing price, the higher yellow horizontal line is below the 2010 YTD and all time closing high of 270.83 on April 23. AAPL is just below the price range of April 21 and 22, before the push to the 2010 YTD and all-time high. Apple is also just at the yellow downtrend line, discussed below. The only resistance above is recent. The most recent support, probably minor, is just below at the May 14 and 21 closes at about 254.00. There are multiple levels of support below this. The ongoing EU and Euro Crisis has also pulled down high beta technology sector stocks. AAPL was able to close above the 25 day and 50 day simple moving averages for the week and month. Even through this recent market turmoil and Flash Crash, AAPL has also remained above the 100d sma and 200d sma's. By comparison, the S&P 500, SPX, is below the 25d, 50d, 100d, and 200d sma's. The 25d sma is descending while the 50d, 100d, and 200d sma's are still ascending. The downtrend line, a rate of price descent, is from the April 23, 2010 YTD and all time high of 270.83 down through the April 29, 2010 peak of 268.64. AAPL has stayed below this downtrend line henceforth. 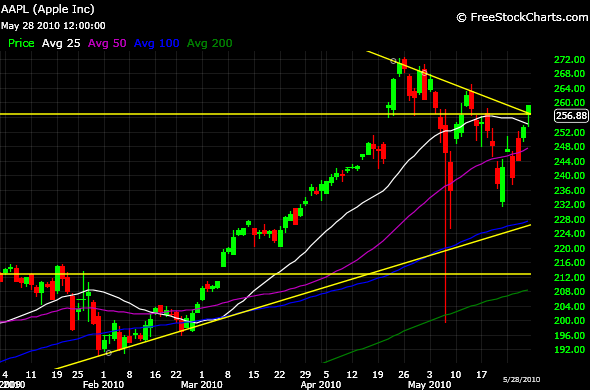 However, Apple did close on Friday, May 28 just below this downtrend line, after pinning upwards through. This was the first time since May 13 the line had been reached. The MACD has been bearish since May 4 as the pullback, Flash Crash, and EU & Euro Crisis pulled the related ema's down. The MACD has been uptrending recently. The lower horizontal yellow line is the 10 month exponential moving average from the monthly chart, which I have overlayed on this daily chart. That is the line in the sand, so to speak, for the long term signal of a bear market. AAPL is well above this signal at the current close, the higher yellow horizontal line. Therefore, AAPL is in a long-term bull market and has been since April 2009. Through the recent pullback, Flash Crash, and EU & Euro Crisis, the fundamentals at Apple Inc. never changed and actually are improving. Apple Inc. is doing great! AAPL is struggling with the overall market downdraft. Apple has been charging ahead with the introduction of the iPad, iPad 3G, a new iPhone OS 4, a new mobile advertising platform (iAd), a new iPhone 4G to be launched in June, overall strong iPhone sales and market share, and now reports of very strong iPad demand (including the international launch). The current price is low based on AAPL fundamentals. The RSI 14 day and 28 day are reasonable. The MACD is bearish but uptrending. The intermediate-term trend became bullish on Friday, March 12 and remains so. The long-term trend remains bullish. Apple Inc. achieved a milestone the week of May 24, 2010, passing Microsoft in market capitalization to become the largest technology company, and second overall largest company, in the USA. AAPL's market cap is now $233.74 billion, compared to Microsoft's of $226.11 billion. Exxon leads with $284.04 billion. Microsoft still leads Apple in total net profits. Over 1 million iPads have now been sold and the iPad is now outselling Macs. The international launch was May 28 in 9 countries and the frenzy ensued. Apple launched the iPad in the USA, the Big Day, on Saturday, April 3. Reviews of the iPad have been favorable overall with 91% consumer satisfaction, and 1 in 5 USA consumers plan on buying an iPad. The App Store keeps adding iPad apps and the iBook store the same. Estimated 2010 sales of iPad range from 3 million units to 10+ million units and it now appears the high side, or even higher, unit sales estimates are valid. It has been suggested that iPad sales might cut into iPhone sales some, but I don't believe this will have a material effect. However, recent data suggests the higher margin iPad is cutting into lower margin iPod sales. So far, no one has come out with a "second tablet" to compete with the iPad, although some may be launched this summer. The iPhone OS 4 was announced on Thursday, April 8 by CEO Steve Jobs. iPhone continues incredible sales and market share. The iPhone 4G may be launched on June 7 by Steve Jobs at the Apple Worldwide Developers Conference. The Q1 results for iPhone were outstanding and pump the profits into Apple Inc. Apple's share of global mobile Web browsing is at 67% from the iPhone and iPod Touch. Business customers are now 40% of iPhone sales per AT&T, which indicates AAPL is cutting into RIM Blackberry market share. The iPhone is now beginning to dominate the Japanese smartphone market. CEO Steve Jobs introduced the new personalized, mobile advertising system, iAd on April 8. This will compete directly, and replace, Google's advertising platform. I personally think this was a bigger announcement than the iPhone OS 4, that is, Apple is going inito the mobile advertising business. While iPad and iPhone sales will positively impact Q2 earnings, the iAd platform may well have a significant impact in future quarters as this revenue stream comes online. ComScore reported the week of May 24 that Apple was the second most visited e retailer in the USA, behind #1 Amazon. Wal Mart, Target, and Netflix are #3, #4, #5. It seems everyone is suing everyone else now over smartphone patents! Mobile computing is the future and smartphone sales are surging worldwide. The stakes are high and the lawsuits, to hopefully at least obtain royalties, should continue indefinitely. HTC, maker of Google Android phones, counter sued Apple this past week over patents. CNBC has done a feature on Apple Inc., "Gadgets Galore", the week of May 10 in their American Titans series. Click here for the commentary and analysis in this feature. Q1 earnings were released on April 20 and AAPL beat on revenues, EPS, and outlook. Numerous analysts raised price targets to $300+ within 48 hours. Merrill Lynch raised their target to $325 the week of May 24; current chart of analysts' ratings and targets here. Q2 will include iPad sales and should be another stellar quarter. More than 50% of Apples sales are outside the USA.